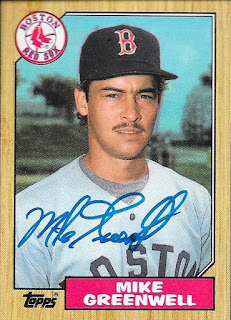 I added a really tough auto to my 1987 set through another private signing on SCN. My friend, Jacob, told me about the signing with Mike Greenwell, which I had somehow missed seeing. Thankfully, I got in the signing in time, and got this card back. It turned out really well. Greenwell (b. 1963) played in the majors from 1985 to 1996 for the Red Sox. He had 1,400 hits, 130 home runs and a .303 batting average. He was a two-time All Star (1988 and 1989) and won the Silver Slugger Award in 1988. His best (and only) finish in the AL MVP voting was 2nd in 1988 (to Jose Canseco). I mailed to Greenwell on December 1 and got the card back on December 26, for a 25-day TAT. I paid a fee of $15.00 for the autograph.